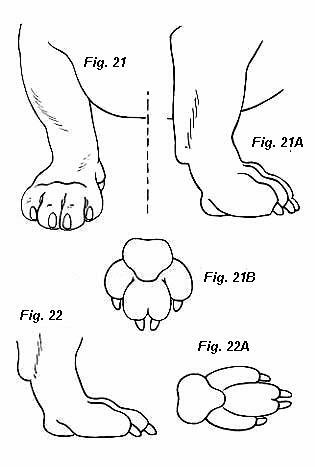 Figures 21, 21a and 21b: show the correct form of the feet. Forefeet should be large, round and close-knit, with firm pads and a distinct arch to each toe. There are 5 toes, but only four in use. The skin on the forelegs should not be wrinkled. The feet may be turned slightly outwards or quite straight. Figures 22 and 22a: show an incorrect, long, narrow foot (“hare foot”). A small, round “terrier foot” is also incorrect.